← Another country has had enough. Tree boughs crashing to the ground and having to be removed due to one blocking access. And the beginning of my struggle with the chain-saw. I think I need lessons in how to start a chain-saw as it took me ages to get the bloody thing started. But eventually it did and I spent 4 hours sawing and removing heaps of creepers and very heavy green wood. In a recent essay I read, by William Laurance, he writes of creepers or vines as being the flashy junk bond traders while the standing older trees being old money, deeply rooted, growing slowly, investing in producing heavy trunks and branches, supporting leaves which provide cover and homes for a multitude of life. The vines twist around dead and living wood and in time pulling the limb down by their sheer weight and grip. But in the vines I found remnants of many birds nests. Job well done which saw me ending up enjoying using the chain saw and understanding why some men just love using them. 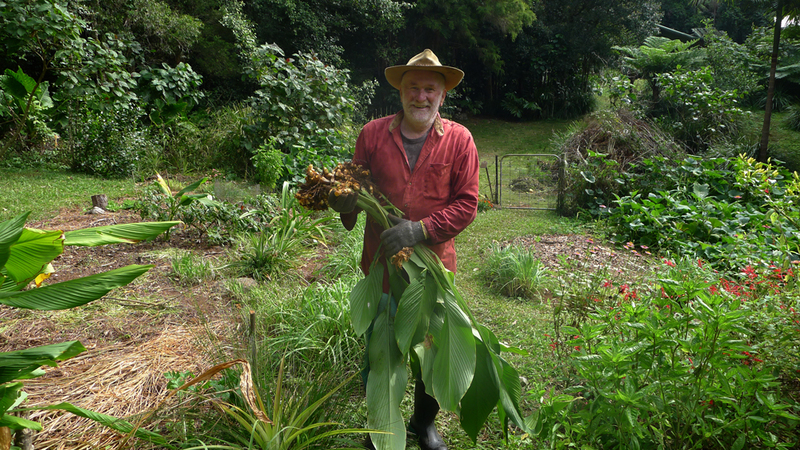 Turmeric in abundance ready for harvest. 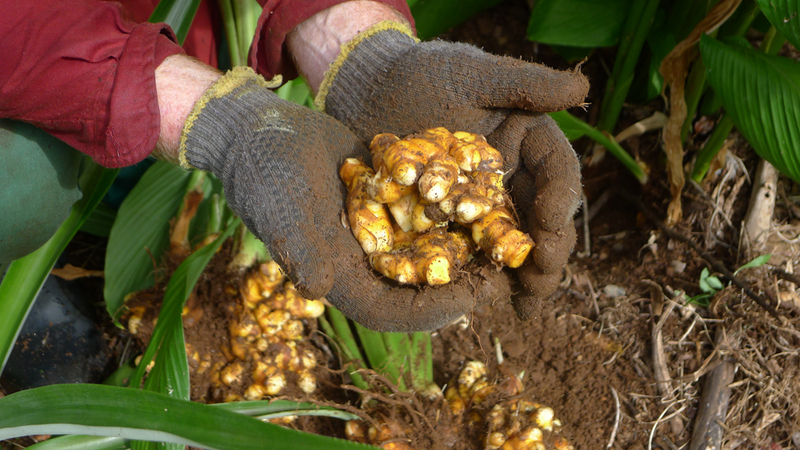 Turmeric’s earliest record is from Assyria in about 600 BC, arriving into Europe pre the Middle Ages where it was known as Indian Saffron because it was used as a dye as well as in some cooking. Lots of health benefits now spruiked for its rhizomes but I use it sparingly in my stir fries. Sad week for Nepal and its an effort to sift through all the requests for donations. Also our media has been saturated with the Bali executions. I can’t imagine what those poor individuals suffered in the on/off dates given but lets not forget many other countries (58) still execute and we are formalizing closer relationships with them. Iran and Saudi Arabia and the US and China come to mind….. countries too where gay people are thrown off buildings and if they don’t die from the fall, are stoned to death by the baying crowd. Finally, impressive NZ ( Aotearoa ) energy progress.